Some time ago I picked up this copy of English Fairy Tales intending to read it before our trip to England. I must have started it more than a year ago. What happened was I took it on our flight to South Korea last Spring (still had the airplane napkin in it which I had used as a bookmark!) and then life with a new little bookworm in the house sidetracked me. I tried this title again around Christmas time but didn't make it through then either. This summer, I determined to finish it! I think it's quite lovely to know a culture's own fairy tales before you go visiting. 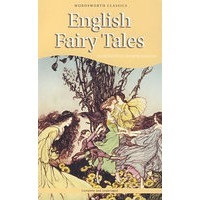 I tried to find out exactly how many English Fairy Tales exist and this is the only source I could find that listed at least 140 and likely more. Someone much more knowledgeable than I will have to explain the history of them and which is the best volume of collected works. The edition I purchased is fantastic if you want a taste of what they are like but it is clearly just a sampling. While I was reading I kept trying to decide which was my favorite of the stories and I never could decide. By the time I got to Molly Whuppie and the Double-Faced Giant (which is near the end of this collection) I had decided that was my favorite but truthfully there were many besides. By the way, I've linked the title of that story to a source online. If you want to read it there, you may do so and that story gives you a good flavor for what to expect in the rest of some of these lesser known tales. Honestly, I'm not quite sure what to add to this post. These are fairy tales therefore they are fun to read. (That's my logic anyway.) It was enjoyable to come across tales which were both familiar to me and new, and to attribute them to the correct source. (So, you see?, reading fairy tales is also educational.) If you want a collection of short stories with a fanciful twist to them, I have no reason to hesitate in offering you these. It's a great little book that is easy to get through and, as I say, is lots of fun. I have a book of Grimm's fairy tales, and they are indeed grim in places! But it's interesting to compare the way we've always heard it with the way it originally was. I love Molly Whuppie! Actual fairytale heroines are so much more interesting than Disney princesses. @FancyHorse - Of course! No problems at all! Did your version of the three sillies include the axe/mallet in the ceiling? Or just head straight for the three sillies? I always love the part about fishing the moon out of the water! It included the mallet in the ceiling, yes! I learned the hard way not to read fairy tales before bedtime. (most of them, anyway) As I was reading Little Red Riding Hood(last year), I turned around and found my Grasshopper covering his head in fear. I immediately put it away, and felt like the worst mother in the world! ;) We DO love fairy tales around here, though!